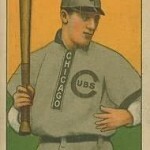 Cubs backup infielder Heinie Zimmerman celebrates his 21st birthday (Feb 9) this week. The youngster will have a big impact on the Cubs this year, but not in a good way. He will eventually become a great hitter (winning a batting title in 1912 and nearly winning the triple crown), but he will always be considered a trouble maker in the clubhouse, and a terrible fielder. In 1908 he will commit several costly errors, but his defining 1908 moment will be even more dramatic than that. Upset by a taunting comment from teammate Jiy Sheckard, Zimmerman will nearly blind him by throwing a bottle of ammonia at his face. His teammates, led by manager Frank Chance, will beat him to a bloody pulp for that. In the following years, Zimmerman doesn’t change his spots. In 1914 he will get into a fistfight with his teammate Roger Bresnahan on the field after Bresnahan complained about his shoddy fielding (he had several games where he made four errors in the same game). Later that season, he will get into a fight with three players on the Braves, including former teammate Johnny Evers. He’ll leave the field that day with a bloody nose. The following season he’ll fight another teammate (George Peace) after another complaint about his bad fielding. His temper will eventually get so bad that a fan will send him half of a one-hundred dollar bill with the promise to send him the other half if he can go two weeks without getting ejected. He never collects. He was traded to the Giants in 1916, and made a boneheaded error in the World Series the following year that helped the White Sox win the championship. In 1919 he walked up to the mound during a game against the Cubs and told the pitcher that it “would be worth your while” not to pitch too well that day. The pitcher, Fred Toney, told his manager John McGraw, who immediately kicked Zimmerman off the team. 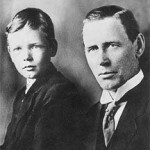 He and his teammate Hal Chase, a fellow suspected game fixer, were banned from the sport forever. After his playing days were over, Zimmerman went into business with mobster Dutch Schultz and ran a speakeasy for him in New York. 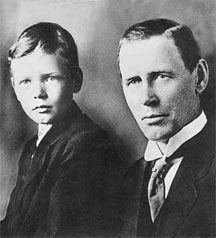 ~Charles Lindbergh turns 6 (Feb 4). His father is serving as a U.S. Congressman from Minnesota. ~Babe Ruth turns 13 (Feb 6). He has been taken away from his saloon-owning father and is causing trouble at St. Mary’s Industrial School for Boys in Baltimore. ~Jimmy Durante turns 15 (Feb 10). He has dropped out of school and is working as a full-time Ragtime pianist. ~Cubs backup catcher Pat Moran celebrates his 32nd birthday (Feb 7) as he gets ready for the big league season. 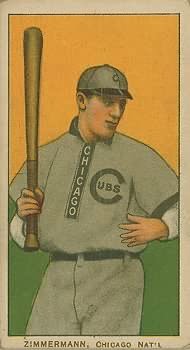 He had been acquired from Boston just prior to the Cubs pennant run of 1906, and will play many important games in 1908 after Johnny Kling gets hurt. After his playing days, he manages the Cincinnati Reds, including the 1919 team that will win the World Series thrown by the White Sox. At The Movies: Vive la vive de Garcon, a comedy about a pain in the neck mother-in-law, premieres. If you travel back in time, don’t tell someone to “zip their lip.” The Zipper won’t be invented until 1913.